Home » Blog » Courses » Looking for something to do now winter is over…Why not try learning French? Spending a winter in a ski resort like Morzine is pretty fantastic but it can also be extremely hard work. Whichever area you’ve been working in for the last 5 months it’s likely you haven’t had time for much else. Whether you’ve been hosting in a chalet, working as a transfer driver, managing chalets, cleaning, looking after children or working on the slopes, winter for everyone is pretty full on! However, the season is well and truly winding down now and spring is just around the corner. Perhaps you live here all year round or have decided to stay on after your winter season and are looking for a new challenge for the coming months. Why not put “learning french” at the top of your list? If you’ve decided to stay in Morzine for a long period then you’ll benefit from being able to at the very least hold a conversation in French. It is, afterall a French town! Having a basic grasp of the language will also help you navigate paperwork and post that you’ll need to filter through once you decide to make Morzine your home. In addition to this, you’re bound to make friends and speaking the language can only help! Schools, trips to the doctors, the weekly shop, ordering a drink, going out for dinner all suddenly becomes easier when you have some french in your back pocket! What courses are available to you? So as the seasons begin to change and we say goodbye to the snow and hello to the miles and miles of green rolling meadows and stunning alpine flowers, the offering at Alpine French school also changes. We’ve got lessons to suit everyone from French intensive courses to weekly group lessons. We also offer private lessons if you want to quickly make a difference to your french. French intensives are a great way to give your French a quick boost. They’re effective because you’ll notice the difference almost immediately and it really gets your mind thinking in the correct way. We have courses available in June, July and August. You’ll do 15 hours per week between 9am and 12pm every day. By the end of the week you’ll notice that you’ve really come on both in your understanding and your speaking. If you prefer to spread your learning out over a longer period of time and enjoy taking a break between lessons then you might enjoy signing up to our weekly group lessons. There are sessions available throughout June, July and August for students of all levels. You’ll do 1.5 hours of learning per week and then have time to go home and digest everything you’ve learnt before your next class. Perhaps you’d prefer to have some private classes to help you focus on specific things that you’re personally finding difficult. We have these available throughout May so perfect timing for someone looking for something to fill their newly found free time! 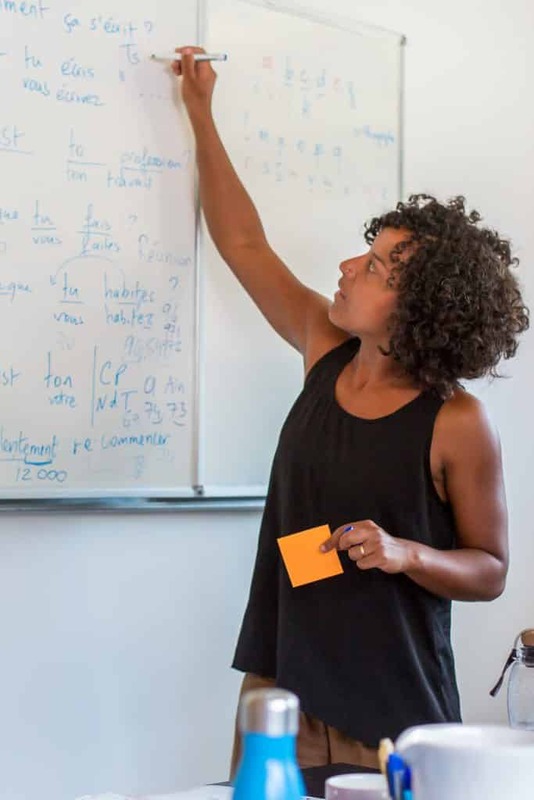 They’re also tailored to your specific level so you’re bound to see a significant difference in your French after a series of private lessons. If you’re self employed or working for a company here in Morzine you’ll also likely have access to a training budget. This will help you finance your new hobby/challenge!